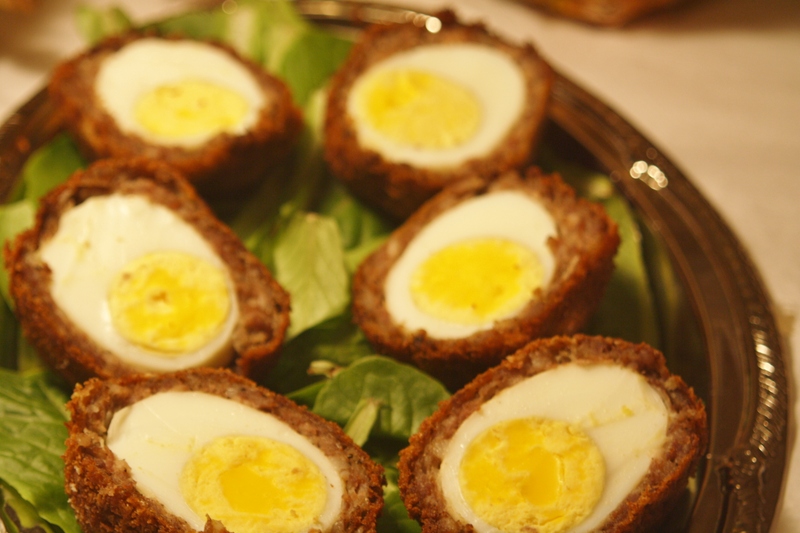 Honestly speaking…there’s no way that Scotch Eggs could go wrong. Seasoned sausage surrounding a hard-boiled egg, then breaded and deep-fried? This British recipe found its way to Nigerian cuisine and has remained a favorite for special celebrations. Here’s the recipe, it may be a good way to use any extra Easter eggs!!! -Season sausage with garlic powder, salt and hot sauce. Mix until evenly combined. Take a handful of sausage meat, flatten it between your hands and mold it around an egg so egg is fully covered by sausage. Add the Cajun seasoning to the bread crumbs. Dip each egg in flour then dip each floured egg in the beaten egg batter and lastly dredge evenly in bread crumbs. Deep fry in oil 4-5 minutes or until dark golden brown and sausage is cooked through. Cool slightly, slice and serve plain, as a side or with a dip of choice. Enjoy!